Lilian Faithfull Care offers the highest standards in end of life care to people in all our homes. In every home each resident, with their families, will have the opportunity to consider and discuss their wishes and thoughts about their final days with our staff, through the preparation of their ‘Advanced Care Plan’. This is to help clarify a person’s wishes, needs and preferences, which will help us to ensure the care we offer meets these needs. Essentially, it describes what they want to happen, what they don’t want to happen, and who will speak for them. It guides our staff, and everyone involved in that person’s care, in making decisions about their medical condition. It also ensures that spiritual beliefs are respected and that personal preferences, both before and after their death, can be followed. 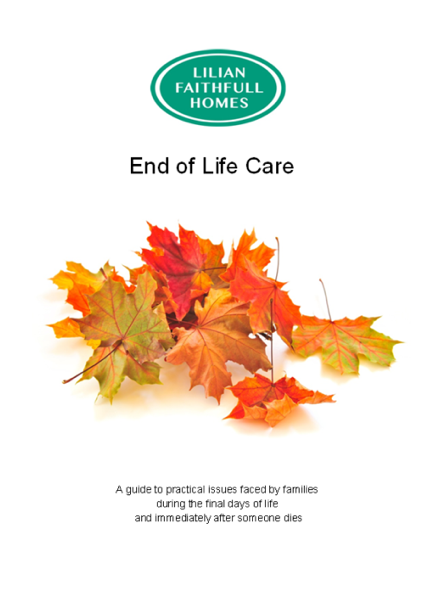 For further information talk to the home managers and look out for our end of life care leaflets available in the home. Resthaven was my wish come true. To find a place to live your last few months with care, kindness and love given by the wonderful staff and to see how happy my father-in-law was, I must have been blessed finding Resthaven. Resthaven made it possible for my father-in-law to leave us with happiness in his heart. Thank you all.